“Dog With Bones”, a new mural by SHOK-1 in London, UK « Adafruit Industries – Makers, hackers, artists, designers and engineers! Super cool, new work from SHOK-1 – via streetartnews. ‘Dog with Bones’ is the latest work in British artist SHOK-1’s X-Pop series that takes a look inside popular icons and symbols. 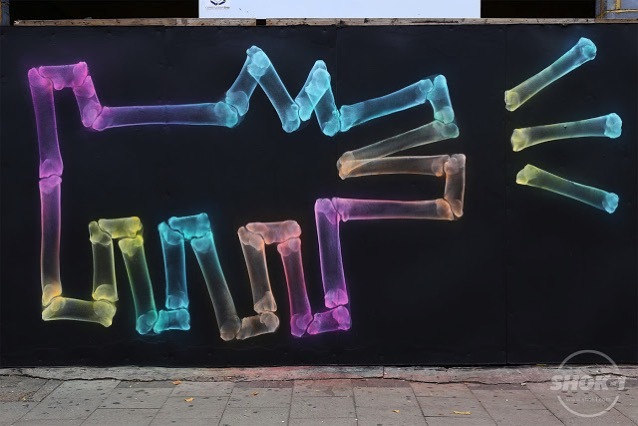 A reinterpretation of one of Keith Haring’s iconic dog paintings, the piece was spray painted in the heart of London in the artist’s unique X-ray style using a classic neon 80’s colour scheme. The piece is an unexpected and witty twist on an animal X-ray.